The top 10,000 Fantasy Premier League managers are holding off on stockpiling their squads full of Double Gameweek 25 players. With Manchester City and Everton playing twice in the next round of matches, it looks as if those at the top echelons of FPL have preferred not to focus so heavily on them just yet. 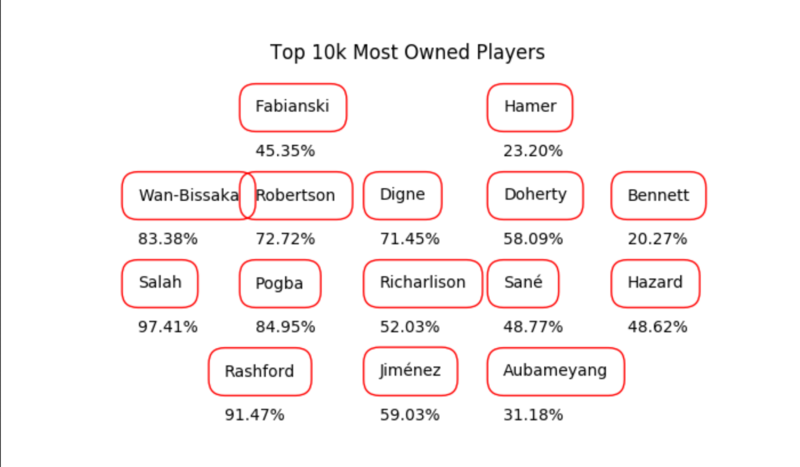 Analysis of the most popular squads in the top 10,000 of the worldwide rankings shows that no more than three players with two fixtures in Gameweek 25 are currently in the template. As you can see from the graphic below, those options are Lucas Digne (£5.3m), Richarlison (£6.8m) and Leroy Sané (£9.7m), which means there may be some transfer work to be done ahead of the Double Gameweek. The Everton left-back, benched for the Gameweek 24 trip to Huddersfield Town, is by far the most popular, currently in 71% of teams in the top 10,000. That may have been because he would have been the easiest of the touted Double Gameweek 25 options to bench when he experiences a Blank in Gameweek 27. However, that large number of owners may have a transfer to make in Gameweek 26 now that Digne has picked up a one-match suspension following a sending off at Huddersfield. That means he will play just a maximum of one Double Gameweek fixture. Richarlison, who proved his doubters wrong by finding the net at the John Smith’s Stadium on Tuesday night, is the second most popular, currently in 52% of teams in the top 10,000. The fact that Sané is the most fashionable Manchester City option is reflective of the uncertainty around the Citizens’ team selection. The German international is in 48% of teams within the top 10,000 with the recent relapse Benjamin Mendy (£6.1m) experienced on the comeback from injury playing into his hands when it comes to potentially starting both Double Gameweek 25 matches. It will be interesting to see how many of the top 10,000 managers pile in on further Double Gameweek players between now and Saturday’s deadline. It is entirely possible that managers at this level of the game may not concentrate as much on this altered Gameweek as we might have imagined. 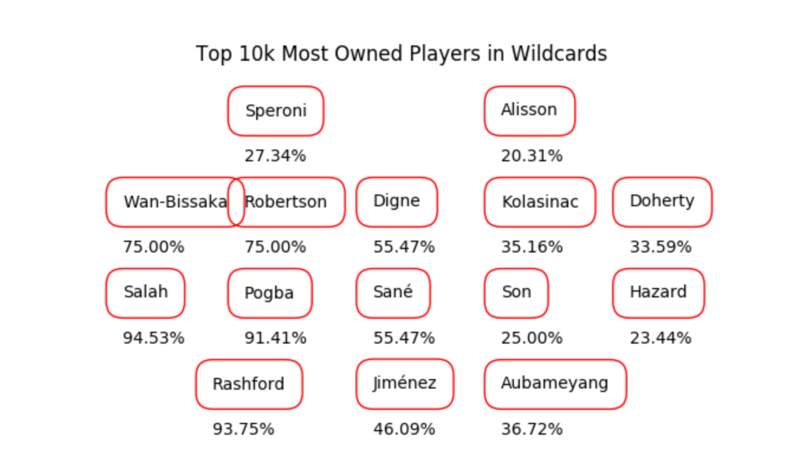 After all, a quick look at the most common Wildcard squad inside the top 10,000 managers for Gameweek 24, shows just two players from Everton and Manchester City, Digne and Sané. 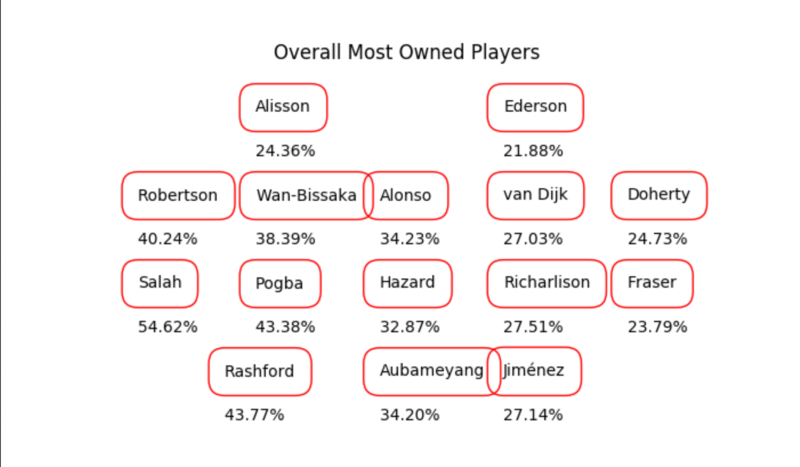 Other interesting angles from analysing the Wildcard squads among the top 10,000 managers is the fact that Son Heung-min (£8.6m) is in 25% of them, while Eden Hazard (£11.0m), who blanks in Gameweek 27, is in 23.44%. However, it does look as if the top level managers are at least more prepared for Double Gameweek 25 compared to the rest of those playing FPL. Analysing the most popular players in overall squads, we can see just two Double Gameweekers in Digne and Sané, and of course only one of those has a chance to play in both matches now. They are also less well represented as a proportion at that level too, with just 27% in possession of Everton’s French left-back and 42% owning Sané. Tempted to bring in Sane and Aguero for Hazard and Firmino and deal with Digne later. City will need to step up now. Good moves? Anyone considering D. Silva for double gameweek? What do you think are the chances he starts both games? Can’t afford Sane. Agree, but I am thinking about transferring him in for short term only. Got to transfer Anderson out. They look good moves. Bobby could do well though. Good moves. Do you own Hazard and intend to keep? I just got rid, i was never going to captain him so just thought it was best to get rid. Plus I didn't have salah at the time so it made it an easy decision. I would hold on to Firmino. Better option than kun for the dgw then aubameyang long term do you think? I’ve 2 FT and need some help! Considering this tonight after I see who plays. If B then swap Serg to Aub week after. I'm considering B. Seems like the best move. Nope. He’s been standing in for Boly. Thinking about only having Sane for next week for City. Saves transfers down the line. Digne,Anderson and Kamara to sort out. Don’t really want Richarlison after next week though. 0. Might get Sane if Hazard has a shocker, otherwise that number won't change. 0 shot, 0 chances created, yellow card. hmmm, not a good performance just before DGW! I've got all my chips left (wildcard, bench boost, free hit, triple captain) and am worried I may run out of time to maximize the benefit. Any wisdom on when best to use these chips? What's everyone planning?